At all points throughout a product’s life cycle, it is essential that that product is checked and re-checked for faults. Our goal is to deliver a fully tested product that meets or exceeds our customers expectations. This requires thorough and robust testing. WORLD offers a complete barrier of formidable tests which detect faults at their root and prevent wasted time, effort and resources. It is critical for our customers to locate product flaws before their circuit boards reach the market. As such, WORLD offers exhaustive and thorough testing processes, which includes many different methods: burn-in testing, in-circuit testing, and functional testing. Our three temperature chambers allow temperature cycling so that our clients can rest assured of the quality of their finished product. The burn-in is a common testing process whereby the components of a given system are put through a trial run prior to their release for sale, and occasionally prior to assembly. The goal of this process is first to ensure that the components generally meet the specification for our clients’ various goals, and second to weed out any part of the manufacturing process which may affect specific, individual components. WORLD is capable of testing throughout the manufacturing process, or simply at its conclusion. During the burn-in process, it becomes possible to detect any components that will fail not only because of a specific physical defect, but also because of a more general failure that occurred during assembly. Any components that fail during the initial phase of the burn-in are identified and replaced. This ensures the design is stable and is a significant benefit for all our clients. Temperature cycling can be separate or part of the burn-in process. It is where the components are tested first at a low temperature, and then at a high temperature. This form of the environmental stress test is designed to replicate real-world conditions, where the products of our clients will be used at both high and low temperatures and will experience failures like power surges. After burn-in testing, we can better understand the load capacity of any given component, and say with certainty that the product meets our clients’ specifications. Given WORLD’s extensive experience with these processes, we have refined our manufacturing process such that they now result in the failure of only a small number of assembled products, making manufacture quicker and more reliable. Our testing equipment has been carefully chosen to impose the most comprehensive, demanding and reliable burn-in and temperature cycling processes among our competitors. In terms of testing equipment, WORLD has spared no expenses. Our environmental chambers used for temperature cycling can become as cold as -84 degrees centigrade. At the other end of the spectrum, our low-mass nichrome heating elements are used to reduce thermal lag and provide rapid response to instrument demand up to 190 degrees C. This demanding process results in the failure of PCBs, but it is better to identify those error prone boards prior to sale rather than after. 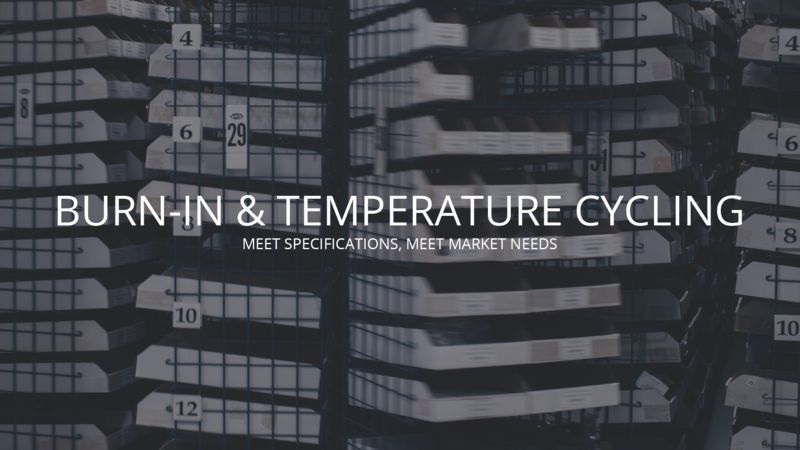 Uniform conditions within the temperature cycling chambers are centigrade assured through the use of a vertical-down recirculating conditioning system. WORLD demands the most consistent and precise testing of all products because, without consistent and precise testing, reliable products are impossible to manufacture. These factors combine to reassure our clients that they receive the best possible product from WORLD, every time.